Hi, friends. To be honest with you, I debated whether this post should go live today or not. Since writing it, life has taken a heartache-filled, roller-coaster ride, and I wasn’t sure that this was the time or place to share it. But God…He’s been whispering something to me over the last few days, even as doubt filled my heart and the tears overflowed. Sometimes the story changes…but the message doesn’t. And so I share it here with you today. And if you would pray for my family during this journey and time of loss, we would be so grateful. We know God is good and that He will heal our hearts. Blessings. It’s not a secret to any dreamer out there that sometimes we get caught up in all of it. In writing, in adventuring, in looking for the next big thing that will push us to take another step. And there’s nothing wrong with that. Dreams require drive and determination. And bravery. But I also wonder something else. I walked through the back porch door with Maelie several weeks ago. We’d been at the park for our weekly Thursday play date with friends, and though it had been hard to get up and leave the house that morning, I’d made us go. As my feet hit the porch and the door closed behind me, I looked at the little glass table and saw it. It wasn’t big. It was little. Simple…but beautiful. You see, she knew. My friend knew that I’d seen one line instead of two that morning. She knew how much my mommy heart ached to experience it all once more and how that dream just didn’t seem to be happening. And so she went out of her way on a very busy day. 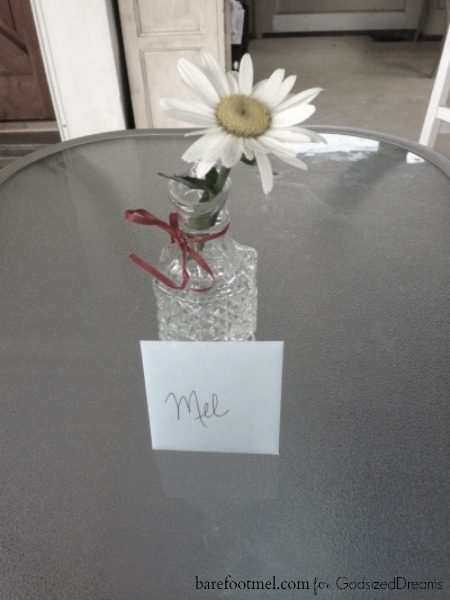 She picked a daisy, put it in a little vase with a red ribbon tied to it, and wrote a sweet note. And it was in those moments that I was reminded….Jesus does love me. He loves me in the ways that I don’t see, in the best ways that I can’t possibly understand. But he does. And though tears dripped that afternoon and my sweet Mae wondered why, I was so grateful…grateful that a sweet friend had taken time out of her day to bless me. There are too many times when I become overwhelmed with my dreaming journey. The next step seems so difficult, the busyness of everyday crowds out the time I need to actually step forward, and sometimes it all just seems impossible. I don’t know if the dream of becoming a mommy again will happen…I can’t see the future, and we aren’t promised those kinds of things. But I do know something. I know I’m loved. I know we are all loved. And I know that the small act of kindness shown by my friend is something I will hold in my heart for a long, long time. On the hard days, I will go back to that daisy and the precious friend behind it. Or, I think of those two girls…we never even learned their names. But I wonder if, on days when they’re not feeling beautiful, my daughter’s words might return to them. How can you change the world today, my friend? Who needs a little love? Who knows? A small act of kindness just might make someone’s day. I’ve been having QUITE the time lately. I occurred to me, particularly as I read this, that the moments that have most lifted me were the moments I got out of my own way allowing God to use me. Thank you, sweet girl, for the necessary reminder. I DO think it’s these small kindnesses that are the most life-changing. They aren’t required, so they just scream of love! I saw a beautiful young woman yesterday (the kind who probably doesn’t see her own beauty) and almost told her so. I hope I see her again today so I can. Thanks, Mae, for your example 🙂 Love you and praying for you, Mel. Ooops . . . Maelie! I pray He continues to show you how very much you are loved by Him and by your sisters here. I’m so sorry that your family is going through this time of loss. You and your family will be in my prayers. 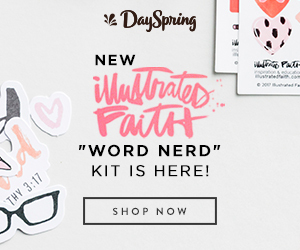 God is amazing – I just subscribed to this blog yesterday. My husband and I found out that our 2nd pregnancy ended with a missed miscarriage 2 weeks ago. Like you, though we are hurting, we know that God is with us. 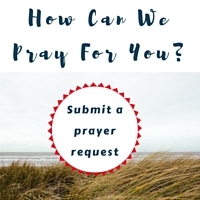 The website link I listed is a link to the blog I wrote as part of Five Minute Friday last week just a few hours after having a surgical procedure because my body didn’t miscarry the baby. Thank you for sharing your pain. Knowing this is a common occurrence and others have gone (and are going) through it doesn’t take the pain away, but hearing how they are dealing with the pain does bring some comfort. You will be in my prayers that you experience all your God sized dreams in His wonderful Glory. Oh, Amy. I’m sending you a giant hug tonight. I am so very sorry for your loss and for the emptiness and ache you are feeling right now. Reading your words tonight just made me want to jump through computer screens and hug you. You are so right…it doesn’t take the pain away, but there is comfort in knowing we’re not alone. This is so good, Mel. You struck a chord with me because even though I have a million things to do, I saw that my daughter needed a bit of extra time with me today. So we sat down for a heart to heart in the afternoon and tonight we’ll watch a movie. Other things can wait. I love that you shared that…you are so right. There are times when everything else can wait…so glad you had that time with your sweet daughter. 🙂 Blessings to you, friend! You are beautiful. Praying for your heart. Thank you so much for your prayers, sweet friend. Love to you. You are so sweet, friend…and your encouragement and prayers mean so much. Thank you.